Due to the high demand for rentals, it’s a great time to be a property owner or landlord. Around 37% of total U.S. households are renter-occupied, according to a recent survey, which is at near historic highs. Seemingly, landlords have a plethora of potential tenants to pick from. But, it’s important to ensure all of your ducks are in a row. To maximize the potential of your rental unit and to help prevent any problems, you need to have a strong rental agreement that delineates the rules for the property, payment procedures, and other responsibilities related to renting. As you draw up your rental agreement, make sure you’re including common terms designed to protect both the landlord and tenant. A rental agreement is a legal contract between the tenant and landlord. A properly structured rental agreement can help to reduce issues with your tenant and can help protect you in court if issues should arise. A detailed contract is also in the best interest of your renter, as it gives them a better understanding of the terms and conditions of your rental. One note of clarification before we get started. Rental agreement and lease agreement are terms that are often used interchangeably, but generally you may find that a rental agreement is generally structured month to month while a lease agreement is usually written to cover long term rentals, 12-month or longer. Regardless if you are drafting a lease or rental agreement, these common terms are typically included. Occupancy restrictions limit the number of people who can officially live on your property. A landlord’s ability to set the number of people that can live in a unit will be subject to local occupancy and rental laws, so you should consult with an attorney before setting occupancy limits in a lease. There are several factors to consider when determining occupancy standards in a rental property. When determining maximum occupancy, landlords can broadly apply a standard of two renters per bedroom. In the early 1990’s, the Keating Memorandum stated that the policy of two persons per bedroom was reasonable. But this was just a general rule of thumb. There were other factors to consider such as size of the bedroom, age of children, configuration of the unit, and other factors. Every room that’s occupied for the purposes of sleeping must have at least 70 square feet in the room or at least 50 square feet of floor area for each occupant. There are certain exceptions to these rules, such as limiting the number of tenants based on the number of bathrooms that can reasonably accommodate the occupants. Occupancy rules and subletting rights are often governed by local law. You should consult an attorney before deciding how to draft your agreement. Include the address of the rental and make sure each adult tenant living at the address signs the rental document. Generally, a tenant who signs the contract will be responsible for adhering to the obligations in the agreement. For you, the landlord, this might mean that if one tenant doesn’t come up with their share of the rent, the others can be legally held responsible for paying the full amount. It also might mean that if one tenant is in violation of the rental contract, you can remove all tenants based on that infraction. Take time to verbally review these consequences upon move-in with your tenant to reduce any confusion that may occur. This also gives your tenants the opportunity to ask questions. Consult your own attorney and local laws to better understand your rights in your own town or city. Dates of tenancy need to be specified so both tenant and landlord are on the same page. Generally, the first day of tenancy is the 1st of the month and if not, the rent can be prorated to reflect the shortened month, although leases can be structured differently. At this point, decide if you want month-to-month terms for renting or if you want a longer lease, which runs from year to year in most cases. Short-term tenancy provides more flexibility for both the renter and the landlord. However, if you have a six-month rental that never gets renewed after the initial period is up, it can be a lot of work going through the screening process again and again. One of the most important parts of a rental agreement is when, how, and where rent payments are made. Be sure to clearly outline the dollar amount of rent that you’re charging and when it’s due. In nearly all cases, it makes the most sense for rent to be due at the beginning of the month. Before covering rent stipulations, we will offer a few thoughts on setting the rent for your unit. As a starting point, a general rule is to charge about 1% of your property’s market value. But this is merely a heuristic to get a sense for how much you could consider charging for rent. And, depending on the value of your property, location and amenities, that number could realistically track in a range between 0.5%-0.8%. However, it is more important to look at your local rental market to understand rent prices to gauge what you might be able to charge. Setting fair market rent ensures that your rental is priced competitively so as to attract renters as well as to maximize your bottom line. Look at comparable properties in the area to understand how much rent is being charged. Get as many data points as you can because these units are competing with your property to attract quality renters. Adjust your price based on factors such as number of bedrooms, amenities offered, location, and size of the unit. The next step is to indicate the appropriate ways the tenant can pay. Be specific. 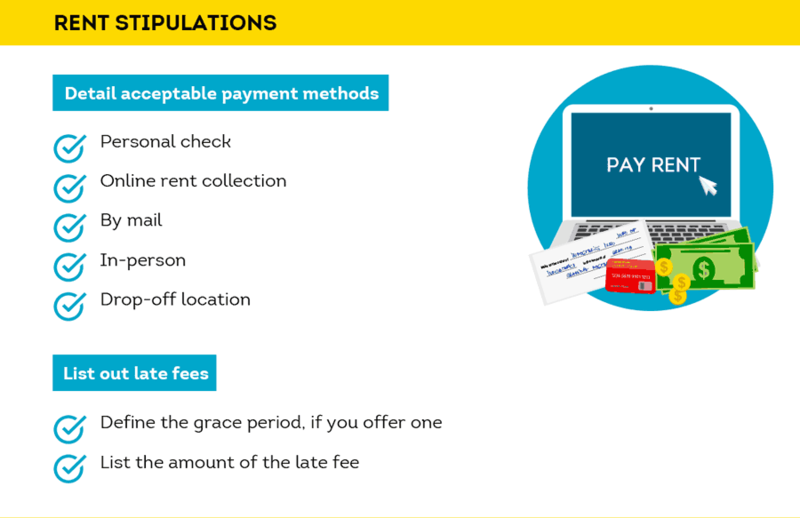 Tell your tenants to what address they should send rent and what are acceptable payment methods (if online or by personal check only, for example). You can also request in-person drop-off or have a specified drop-off location. You should also specify if you’re willing to give your tenants a grace period for late payments. It’s important to note any late fees you plan to charge upon late receipt of rent or if the check bounces. This is also the appropriate section to clearly inform your tenants that if rent isn’t received – or if payments are repeatedly late – it’s grounds for eviction. A TransUnion survey found that payment problems ranked as the top concern by 84 percent of landlords. Using a tool such as Income Insights saves you time and effort by estimating tenant income in minutes and indicating whether further proof of income is necessary. By reviewing income before making a leasing decision, you can better prevent renter payment problems from the start. If you’re a landlord and you’ve had issues with other tenants in the past, it’s a good idea to include behavior clauses and other rules. For instance, maybe you’ve had noise complaints from property management or neighbors in the past. To mitigate similar future issues, state specific “Quiet Hours,” during which tenants must refrain from excessive noise. You’ll also want to include what is considered “excessive noise” by defining it. A dog barking incessantly for several hours, playing instruments loudly, and raucous parties are good examples to list on the rental agreement. Plainly state the fees and steps taken if tenants break these rules and what happens after the first infraction, second infraction, and so on. It’s also smart to add a policy for tenants to be able to formally address concerns regarding another tenant. Describe the proper procedure you’d like them to follow and differentiate between an annoyance and something more serious. Security deposits are almost always required to rent. And, they can also be a source of contention between renters and landlords and tend to be heavily regulated by state and local law. In order to avoid any potential issues, carefully plan out and detail the use of security deposits and the dollar amount so tenants have a full understanding of the requirements and conditions. Pay attention to state laws that limit the maximum amount you can charge for a deposit or the types of activities you can charge. Putting aside specific legal requirements, the rule of thumb for security deposit amount is half to an entire month’s rent. So, if rent is $1,500 per month, a customary security deposit amount would range between $750 and $1,500. In your rental agreement, state how you can use the deposit. 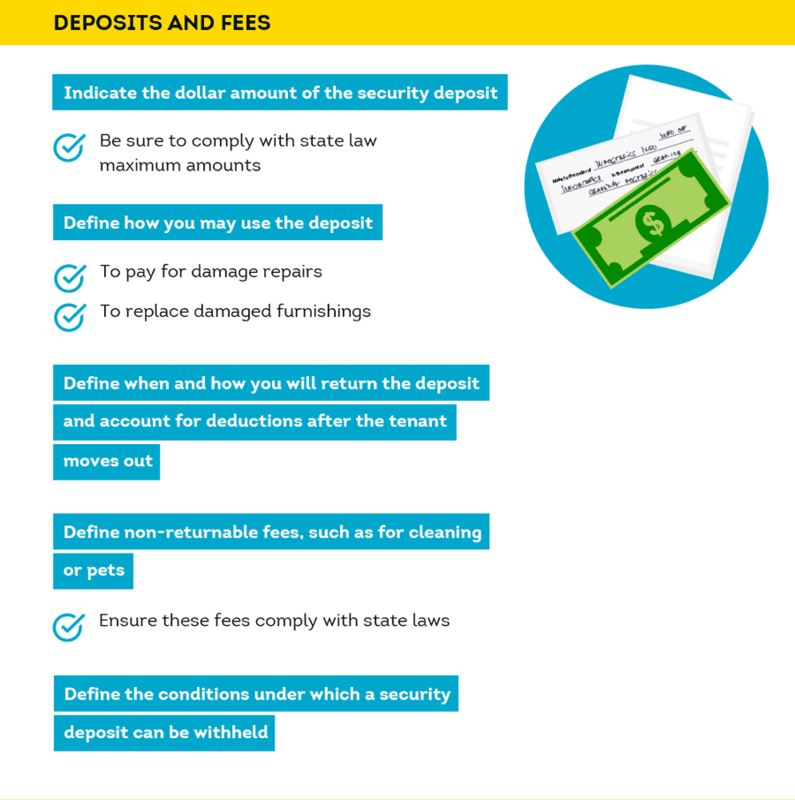 In many instances, landlords will use the deposit to repair damages or cover unusual or unexpected cleaning costs. You should also declare how the deposit may not be used, toward rent, for example. Make sure this section tracks with your legal obligations. In addition, upon termination of the rental contract, you need to decide when and how the deposit will be returned as well as how you will notify tenants of any use of their deposit. It’s also in the best interest of yourself and the tenants to inform your tenants where the security deposit is being held, whether interest is being paid on the deposit, and when or if they get it back. In many jurisdictions, you may be required to do so. As a landlord, you are responsible for including repairs and maintenance within your rental agreement. Outline tenant maintenance responsibilities within your rental agreement to ensure that they understand their obligation to maintain the property according to your standards. Spelling out your maintenance expectations in your lease will give you the evidence you need should your tenants damage or neglect your property. Maintain the lawn as necessary, through watering, mowing, pruning, etc. Clearly express which party is responsible for repairs and who is in charge of fixing and paying for things like washing machine maintenance. Each appliance should have a note as to whether the renter or the landlord is responsible for fixes. If you have tenants who just arrived at your rental, make sure you allow them to document the pre-existing condition of the property before they officially move in. By doing so, the tenant can note damage from the very beginning; this reduces the likelihood of confusion or disagreement between a landlord and tenant on move-out. The critical part of this process is establishing that both parties agree on the condition of the property. Also, declare your expectations and limits on home alterations: painting, permanent hangings, nails in the walls, etc. If you do allow alterations, then clarify with your tenant any procedures that need to be take place prior to their move-out-date: fill any nail holes, repaint colored walls white, etc.